TK Major is a poet, microfiction blogger, and songwriter from Long Beach, California. 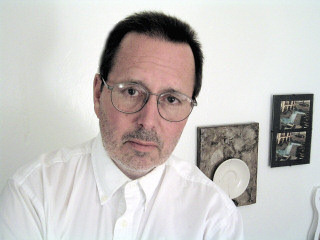 As a student of John Herman and Richard Lee at California State University in the early 70s, Major experimented with fiction and poetry and was, for some time, an avid participant in the LA poetry scene. But life and the bright lure of music and the then-bubbling under punk/no wave scene drew his attention more than momentarily away. In the 1980s, at a time when he was often moonlighting as a recording engineer, Major took up the pen once more to start a couple of mystery novels (about a brave, cunning, and witheringly handsome recording engineer; still in progress, mind you) and wrote a very slim, unpublished volume of poetry — but it wasn't until 2005 that he founded what would would become his favored venue: a combination songwriter podcast and microfiction blog, www.AYearOfSongs.org. In real life, or what passes for it, Major is a web and database developer. After hours, you can find him and his studio music through his social networking nerve center.